Probably one of the toughest realizations about becoming self-employed is realizing you can’t do it all. 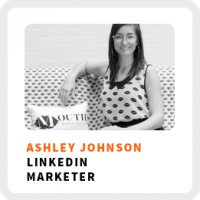 Ashley Johnson shares why it’s so important to build your business around your strengths as she has done over the past couple of years. Why your clients are buying you as much as your product or service. How to know when to leave your full-time job to work on your business full time. Why she’s such a big believer in hiring coaches and taking courses to help her build her business. The criteria she uses to focus her ideas. Wake up time: Around 6:00am. Core work activities + habits: 1) LinkedIn lead generation for the business. 2) Public speaking at conferences and other places to spread the company message. 3) Going on sales calls and interfacing with clients. Ideal work environment: Normally, between 10:00am and 2:00pm, often at networking events later in the day. Regains focus by: Walking away and going outside, without her phone, for about 30 minutes. 90-day goal: Getting ahead of clients’ holiday prep and doubling the client base again. 1) Understand your personality and find a coach that can read your feelings well. 2) Find a group or coach that can effectively hold you accountable.